Town of Grayling, Alaska with the Yukon and the town airstrip. Obviously there’s lots of forest. Photo is dated 1999. I was mortified. The post was based on a report to the federal Housing Demonstration Program that my mother wrote when she visited two housing sites in Alaska in 1966. She loved that trip and the people she met, and retold the story many times over the next 25 years. It’s true that she used the word “Eskimo,” which was the government’s designation of the people at that time; the government subsequently learned better. The Athabaskans who wrote me had reason to be angry; no one wants to be called by the wrong name. It’s also true that my mother used the word “tundra,” though when I checked I found she used that description for only one of the two towns she visited. The other was clearly in a forested area. The mistake was mine. As to derogatory comments about moose meatloaf, well, the readers got me there. Though the remark was rude, I think it’s not unusual and not the worst offense if someone doesn’t care for food they’ve never eaten before. That has been a common experience among travelers since people began to travel. The truth is, though, that I would like to try moose meatloaf. I’ve decided that I would respond after a long day of thinking about this entire blog. I’d like to thank you for responding to my comment. I think it is very nice of you to try and make this blog more accurate than previously written. It would take a very long time to actually explain all the details of what my father’s homeland really, truly is. However, I will say this – unless, you’ve been here in Alaska yourself and went into someone’s home and actually stayed more than a week, it’s hard to sum up our traditions, food and overall life. We are very easy-going people, who work hard on a daily basis to keep the kids and elders fed. Once that happens, if we have time for ourselves after a long day, we may start on some arts and crafts or the men may play a game of poker. Anyway, like I said – until you’ve experienced Alaska yourself, it’s hard for me to sum up what it’s actually like to visit at someone’s house over tea, eat smoked salmon strips, crackers and walking away with the endless smiles and happiness you feel in your heart after a really good visit filled with laughter and fun! 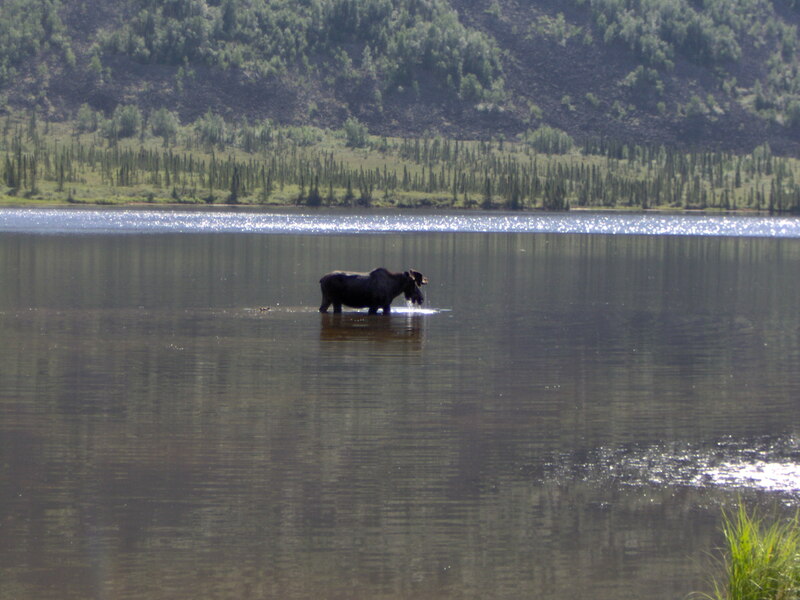 Moose wading in Grayling Lake, Alaska. Some day I would like to try the moose meatloaf made by the local folks. If you like the stories on this website, you may be interested in Against Time: Letters from Nazi Germany, 1938-1939, by Francis W. Hoeber. Details and ordering information are available by clicking this link.